Alice and Rex’s relationship was developing beyond friendship. One evening they were out walking, and Rex asked her if they had enough in common to get along. “I think we get along pretty well,” she said. Alice didn’t know what to say. She didn’t think that he really wanted to marry her, and she was uncertain how she felt, so one night she invited him over to her house for dinner. She relied on her mother and other friends to advise her what to cook, then made enough for an army. Upon eating the meal, Rex exclaimed, “This is marvelous. Why don’t we do this every day?” That was the end of the cooking. After The Conquering Power was finished, Valentino left Metro to work at Famous Players-Lasky, where he made The Sheik. Richard Rowland, Metro’s president, then asked Ingram to direct Turn to the Right as a personal favor to him. The picture had a very nice part for Alice, so Ingram agreed. Rex and Alice were inseparable and very much in love. “I really don’t know when we fell in love,” Rex told her. Not long after, Rex traveled to New York on business. While there he realized that he was lonely for Alice, so he decided to call and propose to her. But instead of giving him an answer, she evaded his question. “When are you coming back?” she asked. “Well, I’ll be on my way right now,” he responded. However, they did not marry right away, but wanted to wait until their next picture was finished. That next picture was The Prisoner of Zenda. It was during this film that Alice became friends with Ramon Novarro; a friendship that would last the rest of her life. Novarro, who played Rupert of Hentzau, was picked by Ingram to groom into stardom. During production of The Prisoner of Zenda, Rex and Alice decided to marry. Without telling anyone, they were wed on Saturday, November 5, 1921, in South Pasadena at a little place called Adobe Flores. The ceremony that was officiated by Dr. W. E. Edmondson, State Chaplain of the American Legion. The following day they saw three films and were back to work on Monday. When the film was completed, they went to San Francisco for their honeymoon. Although Alice knew of Barbara’s reputation as a party girl, she drew the line at many of the rumors. Bangley asked her if some of the stories were true. “I don’t believe all these things they printed about her,” Alice insisted. Alice was more than happy to “put up” with her husband. She knew the best thing for him was work, so she encouraged him to do another film as soon as Where the Pavement Ends was completed. It would again star Ramon Novarro and was based on another Rafael Sabatini novel called Scaramouche. The film’s budget totaled more than one million dollars once production began on March 17, 1923—St. Patrick’s Day. Of course, Ingram, being a good Irishman, reportedly celebrated by getting drunk and continued celebrating for twelve days, shutting down production before it began. Before work began on her next film, Alice accompanied Rex to London where she met his father, Reverend Frances Hitchcock. After what must have been a moving reunion, they traveled to Tunisia where filming began on The Arab, which again co-starred Ramon Novarro. 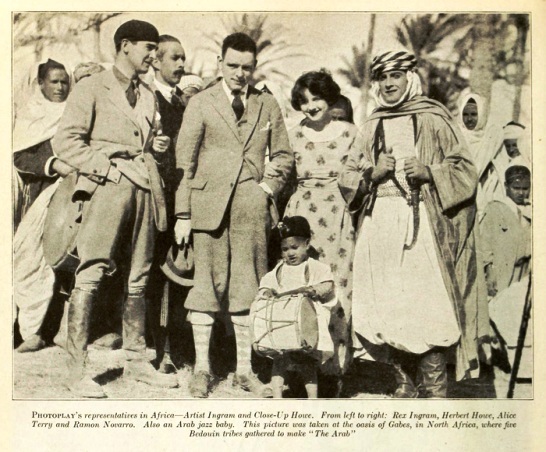 During production, Rex and Alice fell in love with an Arab boy named Kada-Abd-el-Kader and adopted him. He eventually appeared in several Rex Ingram films but would later cause his adoptive parents untold headaches. Alice did not wear her trademark blonde wig. Kada later became a tourist guide in Morocco and Algiers and would always tell the tourists that he was the adopted son of Rex Ingram and Alice Terry. NEXT TIME: In Part Three, Alice and Rex move to the French Riviera where they open a studio and make films without Louis B. Mayer’s constant supervision. 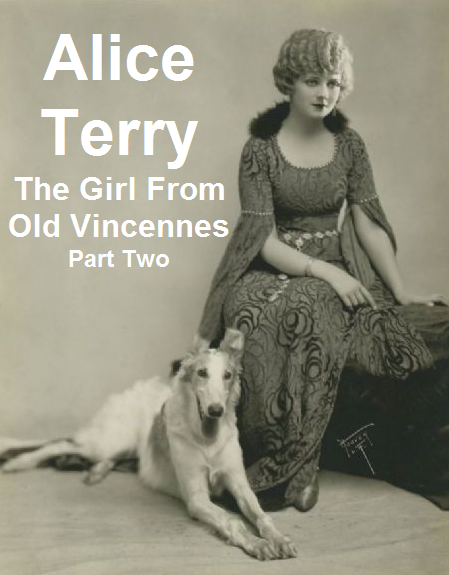 This is the first of four parts on the silent film actress, Alice Terry. Grace, style, and an icy beauty. 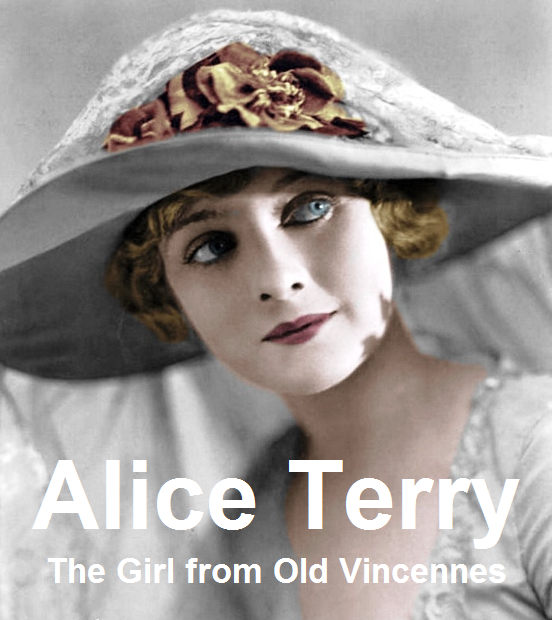 These qualities describe Alice Terry, one of silent film’s most enchanting and underrated actresses. 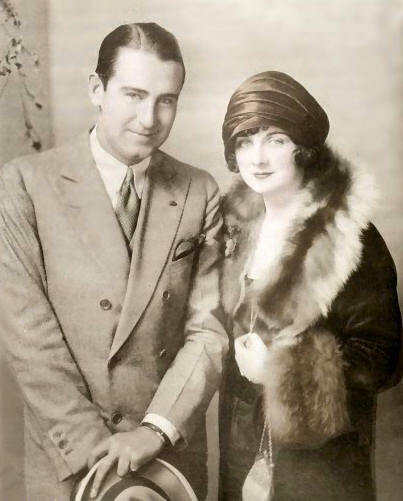 Even though she made only 24 films, her contribution to the film industry along with her husband, director Rex Ingram, could fill a history book. She was born Alice Frances Taafe on July 24, 1899, in a small house on Fifth and Shelby Streets in Vincennes, Indiana. Her father, Martin Taafe, was a farmer who had migrated to Indiana from County Kildare, Ireland. There he met and fell in love with Ella Thorn. The two were married and began a family, with Alice the youngest of three children. By the time Alice turned five years old, the Taafe’s had settled in Los Angeles. Not long after their arrival, Mr. Taafe was killed in a street accident, and Mrs. Taafe took her three children back to Indiana. Within the year the Taafe’s returned to Los Angeles and moved into an apartment building in the beach community of Venice. Regardless of her fleeting fame, money was tight, and in order to help make ends meet, Alice auditioned as an extra for Thomas Ince after being encouraged by Tarzan of the Apes actress Enid Markey, who lived in the same apartment building. Alice promised that she would and then walked off the lot and never went back, not even for her pay check. Afraid of having her hopes aroused again, she decided to make a slight change in careers. She found a job in the cutting room at Famous Players-Lasky, but it lasted only a short time because of her adverse reaction to the glue fumes, which forced her to return to acting. Soon after she received a call from Rex Ingram who had returned from the war and wanted her to pose for a head he was sculpting. Again, their paths did not cross for several months until Alice was called to be an extra on Ingram’s next film, The Day She Paid (1919). However, he spoke harshly to her, and she began to cry. She walked off the set and refused to go back. The next day, Rex called Alice and apologized and asked her to come back. He was going to be changing studios soon, and he had a part for her. Alice told him she would consider being a script girl, but as far as acting was concerned, she was through! 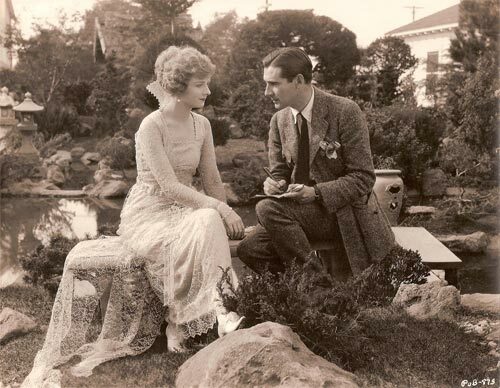 Of course, Rex was able to convince Alice to return, and he gave her a small role in his next film, Shore Acres (1920), made at Metro. 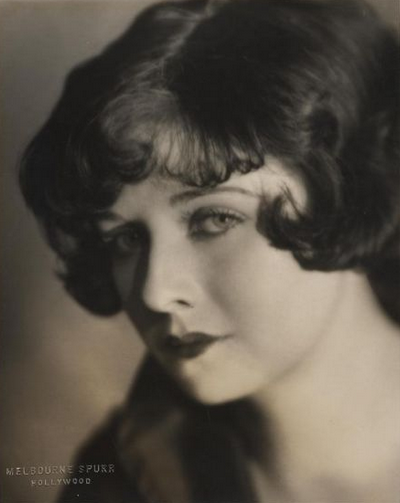 During this time, Ingram was able to find the talent that lay hidden beneath her shyness and decided to cast her in an important role in Hearts Are Trumps (1920). “Look,” she told Ingram, “he can call me Alice if he picks me up. I’m not going to ride on that streetcar and then walk six blocks to the studio.” The next day, Rex provided Alice with a car. Ingram began grooming his young protégé for stardom. First, he changed her name to Alice Terry and had her teeth fixed. He also sent her to a spa to lose weight. During this time they became good friends. They would meet at a Pasadena tea room and discuss the day’s events and each others secret ambitions. He would take her home, and the next day everyone would tell her about the other girls he saw later that night. “Well, good for him,” she would say. She liked Rex very much, but she knew that kind of behavior was not for her. 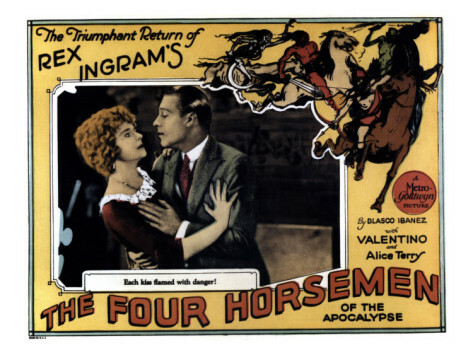 Meanwhile, Metro Pictures’ president, Richard Rowland, bought the rights to the very popular novel The Four Horsemen of the Apocalypse. The Vincente Blasco Ibanez novel had remained on the best seller list consistently, and Rowland felt it could be what the ailing studio needed to rescue it from the brink of bankruptcy. Rowland placed the undertaking into the capable hands of scenarist June Mathis. 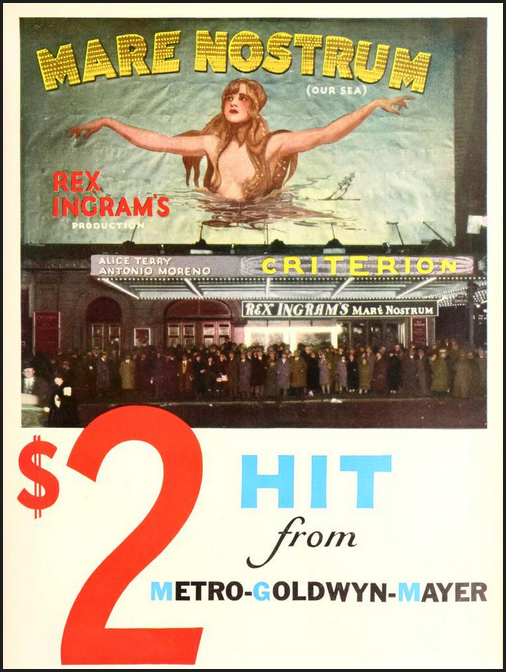 When she suggested Rex Ingram to be the director, Rowland looked at his recent work and saw how little they had cost, compared to their quality. This impressed the cost conscious mogul, and he signed Ingram for the project. Ingram and Mathis did not agree on the choice of the actor to play Julio. Mathis wanted Rudolph Valentino, who was a rising young star. Ingram recalled the young actor from his days at Universal and felt that he could not handle the role. 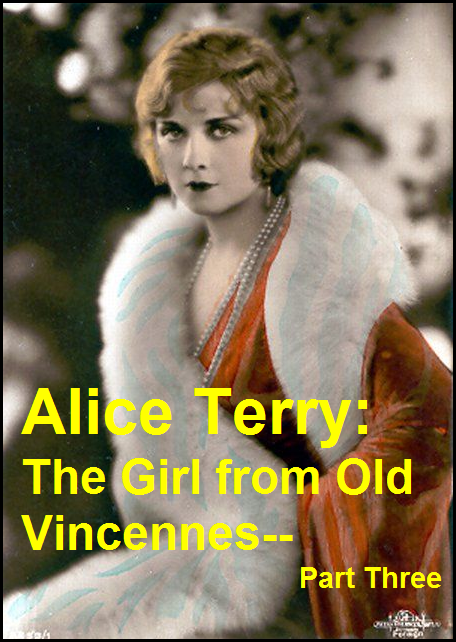 When Mathis agreed to sign Alice Terry in the role of Marguerite, Ingram yielded and agreed to using Valentino. A spirit of congeniality developed on the set, but the work was hard. Rex insisted that the dialogue be spoken in French. Even though it was a silent film, he wanted to impress even the lip readers in the audience. So Alice would get up at five o’clock every morning and study on the streetcar on her way to work. However, after she learned one French title, she would repeat it for every scene. “Nobody could tell the difference,” she reasoned. Valentino became very irritated and told her, “If you say that line one more time I’m going to…” Rex finally insisted that she learn the entire dialogue. The Four Horsemen of the Apocalypse was a tremendous hit and put Metro into the black. It also helped the careers of June Mathis and Rex Ingram and made a star of Valentino and Alice Terry. 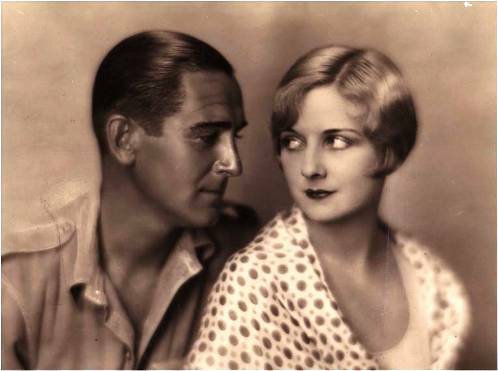 Next week, Part Two looks at Alice and Rex Ingram’s budding relationship and the films she made with Ramon Novarro.